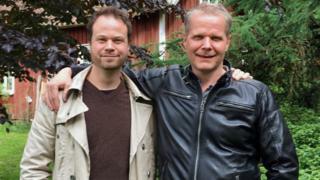 A man who has spent 13 years in prison in Sweden charged with murder has been released after new evidence came to light in a true crime podcast. Spar, hosted by journalists Anton Berg and Martin Johnson and released via podcast platform Acast, has been examining the imprisonment of Kaj Linna for the last two years. Mr Linna was initially sentenced to life in prison in 2004 for murder and robbery. Robert Lindberg was killed in an attack in northern Sweden which also left his brother Sune injured. But a witness who had been involved in the initial trial appeared to undermine his own testimony while being interviewed for the podcast. After the episode was released, Mr Linna used the audio as part of his appeal, and a retrial was granted in December. The audio was also used in court proceedings during the retrial, which concluded at the end of May and found there had been insufficient evidence to convict Mr Linna. Mr Linna has now been released from prison and reunited with his family. In a statement, the Swedish Court of Appeal president Margareta Bergstrom said: "Our conclusion is that the evidence presented at trial is insufficient and therefore can not lead to a conviction." "We're very happy and relieved. We are frankly impressed that a podcast could have this kind of impact," Berg told the BBC. Acast co-founder Karl Rosander added: "It means so much because Kaj Linna has been in jail for 13 years. We actually helped free an innocent man, it's so amazing, and I'm happy for the journalists who wanted to look at the story." The series looking at Mr Linna's case has released eight episodes so far, with each one attracting around 300,000 listeners, according to Berg. "We released the podcast in May 2015, and the retrial was granted by the Supreme Court in December 2016, so that process alone took a year and a half," he explained. The retrial was granted partly due to the audio which had been gathered by Berg and Johnson during the production of the podcast. "We met with a man who was the main witness, and he came up with a different story to the one he put forward in the trial," Berg said. "We had two different microphones in that interview, I was doing the main recording and Martin was sitting next to me and he had a stereo microphone which was there to record atmosphere. "The witness asked us to switch off the microphone at one point, which I did, and he started giving us details which he had not put forward in the trial. "When we got home, we found out that Martin's microphone had been on all the time. Then I called the man and said we had it, but strangely he said that he was fine with that and we could use the audio." Mr Linna's fight for a retrial has been covered widely in the Swedish media since the audio came to light. "The Supreme Court listened to the interview with the witness, and when they did they made quite a fuss about this decision and they granted the retrial. They said that it was crucial, because there were things that the courts hadn't been told before," Berg said. "The case had been built on the testimony of the man we spoke to, and after we interviewed him, he started giving us a new version of events. He was clearly not trustworthy or reliable." He added: "I hope the police will now further investigate this crime, because it's a terrible thing that's happened. It's a murder and robbery, and now it's unsolved again." It is the longest-served sentence to be followed by a retrial in Sweden's legal history. Speaking to Swedish media on Thursday, Mr Linna said: "My time in jail was completely wasted, worthless." When did you last download a podcast?